We know American Idol is coming back, but what about former host Ryan Seacrest? Variety reports Seacrest is “in advanced talks” to return as host for the show’s upcoming ABC reboot. This week, we reported that ABC is reviving the popular singing competition series and wants Kelly Clarkson as a judge. Seacrest hosted the show on FOX for 15 seasons before it ended last year. When the American Idol reboot was first announced, it seemed unlikely that Seacrest would return as host. Recently, he was named the new co-host of Live with Kelly! and is re-locating to New York City for the morning talk show. 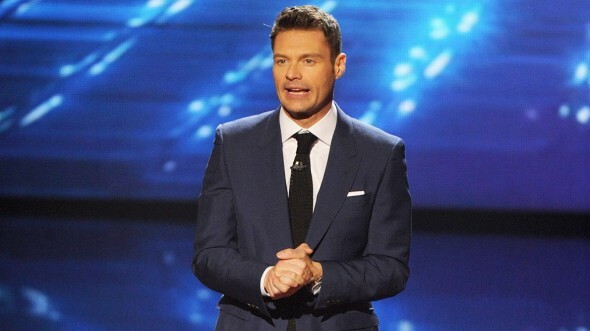 Now, Variety reports Seacrest is in talks with producers to come back to American Idol but neither party has made a public comment. ABC‘s American Idol revival is set to debut in spring 2018. What do you think? Are you a fan of American Idol? Would you watch without Ryan Seacrest? No Ryan , bring Nick Cannon on……. I sure hope Ryan can work things out. He was so a great asset too the show.. Work on it. Wish the original judges were coming back.. Harry, Jennifer, and Keith. they were great. Does the man ever sleep? Is he driven by $ & success? Does he have ADHD? Time will tell if & when he drops from exhaustion. But then, I could be envious of his energy. I am not a fan of Seacrest’s, or of “Idol”. His joining Kelly in the morning is giving me second thoughts about continuing to watch that show, which I have watched since pre-Kelly days.